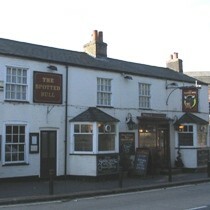 The Spotted Bull in St Albans is a large traditional pub. It has a good layout with bar at back and plenty of seating at the front. At the time of the visit only Fullers London Pride was available on handpump which was served a little too cold. Green King IPA is also normally available as is draught Addlestones. Only five minutes walk from the main city centre pubs but it seems that not many make the effort. Food is served every lunchtime and all afternoon on Sundays. The pub only had a couple of drinkers when reviewed, around 10pm on a Thursday. It's a shame as this is a good traditional pub. It's an ideal place for a quiet drink and a chat away from the hustle and bustle of the pubs in the centre. Steaks now served from Tue to Sat evening, ranging from £10 to £16. Vegetarian options available. New owners since 4th January 2012. "We always have Green King IPA on as a lot of our regulars like it and usually 1 or 2 other beers, recently we had Spitfire and Tring's Mortain Theif. Our cellar is kept on very good order so you should find the beers of excellent quality. We are planning to have a mini beer festival on the Easter weekend too with 8/9 beers. Food wise we are currently only able to offer baguettes, sandwiches and Jackets through the week but offer a great Sunday lunch with a choice of 3 meats, 6 fresh veg and georgeous roasties!!" "My wife and I visited the "Spotted Bull" on Sunday for lunch. A lovely young couple running it, Guy and Abi, made us very welcome. An open fire, good quality Sunday lunch, choice of three meats, fresh vegetables.. Very cost effective, Will certainly go again." "Just had a meal at the The Spotted Bull - Jacket Potato and Chilli. I wasn't really expecting much though was pleasantly surprised by the food. The chilli was very much up to standard and I could tell it wasn't bought in. The potato was also large and fluffy. Also there was a side salad which wasn't over the top and had all my favourites in it. It's as if I'd made this for myself at home if not better! Also I found out that it was made by the landlord himself and he's only been here since January. I wish him all the best in his new venture and hope his standards stay as good as they are now. Hopefully if my work brings me back to St Albans I shall be back to revisit The Spotted Bull and it's beautiful beer garden!!"